No, this isn't an April Fool's joke: A Russian defense contractor has patented a drone that uses a shotgun to blast other drones out of the sky. It comes from Almaz Antey, a Russian defense contractor that manufactures the S-400 Triumf surface-to-air missile that caused a rift between Turkey and the US. 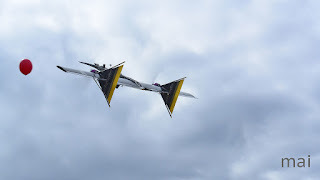 The tail-sitting drone takes off on the spot but flies like an airplane for greater efficiency, giving it a 40-minute range while packing a fully-automatic Vepr-12 shotgun with a 10-round magazine. The drone was built by the "Student Design Bureau of Aviation Modeling" at the Moscow Aviation Institute for Almaz Antey. It's of a similar type used by mining companies, farmers and others to survey pipelines and other installations. A visor-wearing operator uses a live video link to fly the drone and aim the weapon, which is tucked into the nose of the aircraft. A shotgun, rather than a rifle or pistol, was selected for the same reason they're used for duck hunting: the wide dispersal pattern makes it easier to hit a target. For now it's merely a demonstrator, according to the Russian defense site Dambiev. However, Russia is pretty serious about weapons-packing drones, having already created the "Karnivora" drone equipped with nets to take out other UAVs. A "shock" version can reportedly carry high-explosive fragmentation grenades and anti-tank bombs -- nightmare fuel, indeed.